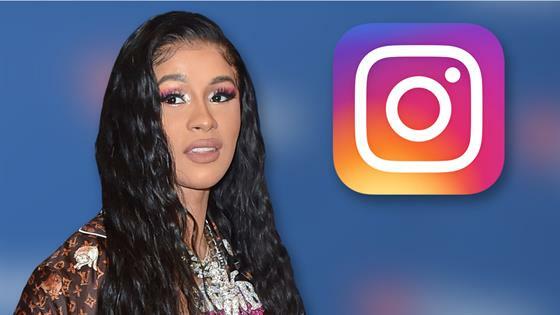 UPDATE: Cardi B seems to have deleted her entire Instagram page just hours after posted an expletive-laden video that she subsequently removed. All throughout Monday, the "Bartier Cardi" artist posted screenshots of fellow rappers supporting her and praising her for her historic Grammys win. Cardi's Twitter page, however, is still in tact for the time being. She retweeted and replied to messages from artists including Lil' Kim, Salt N Pepa, Missy Elliott, Remy Ma and more. Cardi made no mention on Twitter of clearing off her Instagram. Other than her video calling out people who criticized her on her win, Cardi shared other videos of impromptu thank you speeches as well as her daughter Kulture Kiari Cephus saying "Mama" for the first time. Cardi B is clapping back at haters who slammed her after she made history at the 2019 Grammys last night. The "Bodak Yellow" rapper seemed to have the time of her life at the awards show (she met Lady Gaga! ), but some people were apparently unhappy that she took home the Grammy for Best Rap Album for Invasion of Privacy. She officially became the first female solo rapper to win in that category. Cardi beat out fellow nominees Travis Scott Pusha T, Nipsey Hussle and the late Mac Miller. The 26-year-old held back tears while she accepted the award and seem to stumble over her words during her speech. She even brought her husband Offset with her, who held her hand at some points. On Monday, the 26-year-old posted and deleted a video talking about the criticism, which was ultimately captured by a fan account. The account also deleted the video. "You know what, it's not my style for people to put other people down to uplift somebody else. That's not my style and that's not what I'm with and I don't support that, however I've been taking a lot of s--t today," she began. "I'm seeing a lot of bulls--t today and I saw a lot of s--t last night and I'm sick of this s--t. I work hard for my mother f--king album." She went on to talk about being nominated last year for "Bodak Yellow," but she didn't win any awards for the song. "Everybody was like, Cardi got snubbed! Cardi got snubbed! Now this year's a f--king problem? My album went two times platinum my n---a and every chart that there was my album was always top ten, number one album as well!" she said. As she briefly mentioned in her acceptance speech, Cardi then went on to discuss what it was like recording the album while pregnant. She added, "I f--king worked my a-- off, locked myself in the studio for three months my n---a and then went to sleep in my own bed sometimes for four days straight—pregnant! Some songs couldn't even get on the f--king album because my nose was so f--king stuffy from my pregnancy." The "I Like It" artist concluded, "While everybody was harassing me like, you not gonna do it, we know you pregnant, your career's over—that s--t's dwelling in my f--king mind while I'm workin!" On Monday afternoon, Cardi posted a screenshot of a comment from Chance the Rapper, who collaborated with her on the song "Best Life." He wrote, "This is overly deserved, the album was front-to-back hits. It would be inconceivable not to honor u last night. So happy for you, u made history and brought ur husband onstage who I literally saw making phone calls and trips to make sure n---as did right by u and turned they verses in on time." Chance added, "Look man u need to live in this moment for awhile! Straight up bask in it YOU deserve it. Its a feeling very few will ever know, but YOU do." Cardi's caption on the screenshot mirrored her deleted video. "Slept in the studio on leather sofas for 3 months straight , migraines , in Atlanta in Miami away from my family .I have 4 songs that couldn't make the album cause my nose was so stuffy bro I was huffy and puffy," she wrote. The caption continued, "I had @offsetyrn and @brooklyn.johnny reaching out to the world for a verse on top of that I was depress cause everybody was suspecting I was pregnant and I constantly kept reading cardi you 'STUPID' 'YOU RUINED YOUR CAREER' 'WHY WOULD YOU HAVE A BABY AT THE BEGINNING OF YOUR CAREER.'" Cardi shared towards the bottom of the description, "I listen to my album and I cry because I know the hell I went thruu doing the album is always a bittersweet memory.THANK YOU EVERYONE THAT SUPPORTED ME AND LISTEN." Fellow rappers J. Cole and Plies have also voiced their support for the Grammy winner. Ariana Grande took to Twitter right after the award was announced and tweeted about her disappointment that her ex didn't win. In now-deleted tweets, she apparently wrote "literal bulls--t" and "f--k." Miller's mom Karen Meyers attended the show in his honor, and the "7 Rings" singer had some feelings about that. "THEY INVITED HIS PARENTS OUT. NO," she wrote in another deleted message. Grande insisted the tweets had "nothing to do with [Cardi]" but was more so about the act of inviting Miller's parents to the show only to not have him win the award. Cardi acknowledged the messages and being in the same category as the rapper, who died on Sept. 7 at the age of 26 from an accidental overdose. She posted a screenshot of an article whose headline read "Mac Miller's Family Is 'Rooting for Cardi B' If He Doesn't Win at the Grammys" and captioned it "WE WON A F--KIN GRAMMY." She gave another thank you speech in an Instagram video on Sunday night and thanked her "Bardi gang" fans and gave a verbal shout out to the "Self Care" rapper. "I'm sharing this Grammy with you motherf--ker!!!" she yelled in the video. Congrats on your achievement, Cardi! In case you missed the show, take a full list of the Grammy winners here.